When the inevitable relegation of print publications to the digital ether of the interweb finally takes place numerous moments of lived experience will go extinct. In some cases - such as the floor-bound trajectory of countless subscription cards, falling, in twos and threes, out of newly received periodicals like so many airborne seedpods – this absence will be a good thing, if it is noticed at all. Others are more likely to be missed. For example, we will no longer be able to stand in front of a newsstand and survey the myriad visual strategies vying desperately for attention; still the swiftest method of adjudicating mass culture’s endless interpolation of the issues of the day. Indeed, our memories of significant events often turn out to be, upon examination, merely montages cobbled together from the images of various magazines, and we hold a special place for the uniquely well-tempered cover-shots that pierce, at moments, this constellation’s variegated history. The financial crisis, however, has provided a problem for the great minds working in layout throughout the world. At once abstract and universal, the details of our current situation do not lend themselves, or have not yet, in any case, to being captured in any one, memorable image, or even set of images. Thus the newsstand has been treated to endless shots of piggy banks in various states of distress, downward slashing flow charts, and a great deal of big words, brightly colored – such as Newsweek’s decidedly comical “We Are All Socialists Now,” from a few months ago. Two recent covers, however, are worth mentioning. The first is New York Magazine’s “Rage of the Rich,” from this week, and the second is The Economist’s “Under Attack” from April 4. In New York’s case, we get a suited fist, clenched in rage. It’s an image, which, like the article it represents, is somewhat ambiguous. New York has had a difficult time navigating this recession, less avowedly populist than, say, Time Out, the Mag here comes off as hopelessly split between giving the wealthy a place to vent their frustration, and pointing out that they are hopelessly out of touch. Thus the fist on the cover: angry, yes, but also restrained, unsure of what to say or to who. The Economist has no such divided loyalty about defending the right of the wealthy to stay so, and its cover, a straightforward mocking of what is no doubt a non-existent revolution, is interesting chiefly for its clumsiness. A better metaphor for the political predilections of the cultural and financial classes could hardly be imagined. 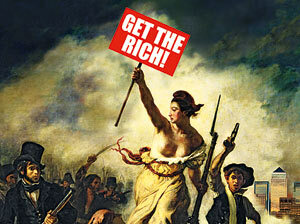 Here is justice, vividly rendered, storming the barricades, and in her hand inserted an amateurish photoshopped sign reading, “Get the Rich.” Presumably the purpose here is to sell magazines by terrifying the target demographic, but given the contrast between the painting and the sign, its hard to see anything other than grievous miscalculations all around.